"Marc Gerstein turns the chancy art of picking stocks into a screen-based science. Next time someone tells you to do your stock market homework, tell them you read this book." "Many times on my radio show my listeners ask what they can read to help them with their investing. Marc has hit the nail on the head with his four-step method to find, analyze, buy, and, the hardest part for many investors, when to sell stocks. I will now recommend Screening the Market as a must-read for all investors, beginning to advanced." "A must-read for investors looking to dissect the stock market and find winning stocks. 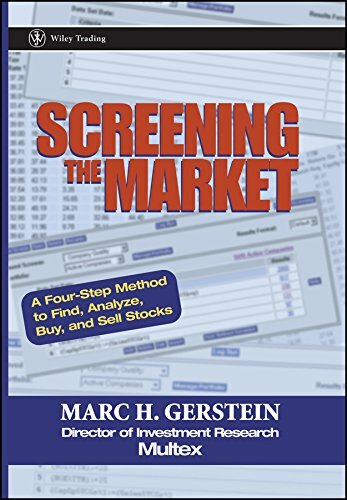 Gerstein simplifies the seemingly complex process of screening stocks, a key tool of the pros, to make it accessible for all investors." If you have any questions about this product by Gerstein, contact us by completing and submitting the form below. If you are looking for a specif part number, please include it with your message.